Sightline Applications develops onboard video processing solutions for unmanned systems in the civil, commercial and military sectors. Our high-performance embedded systems are ideal for integration into unmanned vehicles serving a wide variety of end uses, including Intelligence, Surveillance & Reconnaissance (ISR), environmental surveying, infrastructure inspection, and agricultural mapping. Onboard video processing brings a wide range of benefits to unmanned vehicles, such as low latency feedback for gimbal control and landing guidance, a full digital video path, and low requirements for Size, Weight and Power (SWaP). Our Video Processing Software provides a powerful foundation for all of our processor systems, and includes a constantly expanding suite of functions that improve the performance of unmanned video platforms. Below is an overview of the capabilities available. Provides a range of HD video capabilities, including 1080p/30 and 720p/30 processing and encoding. Dramatically improves video by removing high-frequency noise and frame-to-frame jitter. Also provides ability to correct camera frame-to-frame rotation in applications with platform roll motion, such as unmanned aircraft. Scene tracking provides powerful gimbal feedback based on the entire scene. Tracked objects can be isolated from background using advanced image analysis and motion estimation, and persistent tracking is possible even when view of tracked object is temporarily blocked. Provides low latency location data from object tracking, scene steering, and MTI objects, as well as temperature data from radiometric cameras and focus telemetry for autofocus implementations. Available Ethernet video encoding outputs for reducing system bandwidth include MPEG2 TS, MPEG4 and RTP M-JPEG. KLV metadata is generated in accordance with MISB standards 0102.10, 0601.7, 0603.2, 0604.3, and 0903.3. Provides position, range, and angle data to landing systems of aerial vehicles, and automatically finds and tracks a landing pattern. Works independently of GPS, enabling accurate landing in GPS-denied environments. Multiple detection modes provide important situational awareness information and provide fast feedback essential for effective track initialization on moving objects. H.264 video, full resolution JPEG snapshots with EXIF data, full pixel depth PNG snapshots with metadata, and telemetry data can all be recorded and saved to a local SD card or remote FTP. Enhancement options to optimize video for particular applications include Digital Zoom, Contrast Limited Adaptive Histogram Equalization (CLAHE), Local Area Processing (LAP), de-noising and edge sharpening, false colour schemes, and extended 14 bit-depth processing. Highly versatile options for optimized presentation, transmission and display of multiple video streams. Includes Picture in Picture (with customizable PiP location), split screen, quad screen, and blending of multi-spectral inputs into a single image. 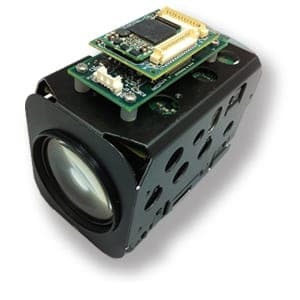 Full autofocus functionality for a range of EO block cameras and lens assemblies, available independent of tracking telemetry. A wide range of flexible and configurable video processing hardware solutions provide simple integration with your systems. Below is a small selection of the hardware solutions available. The 1500-OEM is our smallest video processing engine, designed to add advanced video capabilities to unmanned vehicle camera platforms with low SWaP requirements. The board provides single channel video processing at the source, which is essential for achieving high quality and low latency performance. Capable of handling multiple input channels from a variety of camera interfaces, the 1500-OEM provides a highly flexible video processing solution, especially when paired with our wide range of input accessory boards. The 3000-OEM is our highest performance video processing board, designed for airborne and ground ISR applications with HD video requirements. The multi-channel system incorporates two inputs and provides streaming HD video outputs to 1080p/30. The board provides multiple channel video processing at the source, which is essential for achieving high quality and low latency performance. A wide range of interface boards and other accessories is available to provide for a variety of system integration needs. By submitting this form, you consent for your details to be sent to Sightline Applications and its authorized partners in order to respond to your inquiry. Depending on the location of the organization, your personal information may be transferred and processed outside of the European Economic Area.